This module is ideally suitable for today’s high performance ISM band RF application. The board is intended for applications over a wide frequency range, including the 433 MHz and 868 MHz European and the 902-928 MHz North American ISM bands. 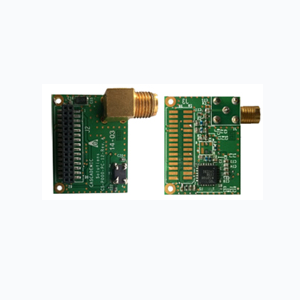 The Module includes a SEMTECH’s low power UHF transceiver, interface connector, filter and a SMA connector(for external antenna). It is intended for use as high-performance FSK and OOK RF transceiver module for robust frequency agile, half-duplex bi-directional RF links, and where stable and constant RF performance is required over the full operating range. High Selectivity: 16-tap FIR Channel Filter. Bullet-proof front end: IIP3 = -18 dBm, IIP2 = +35 dBm, 80 dB Blocking Immunity. Constant RF performance over voltage range of chip . FSK Bit rates up to 300 kb/s. 115 dB+ Dynamic Range RSSI. Packet engine with CRC, AES-128 and 66-byte FIFO.